A new kind of color display. Very low power and reflective. 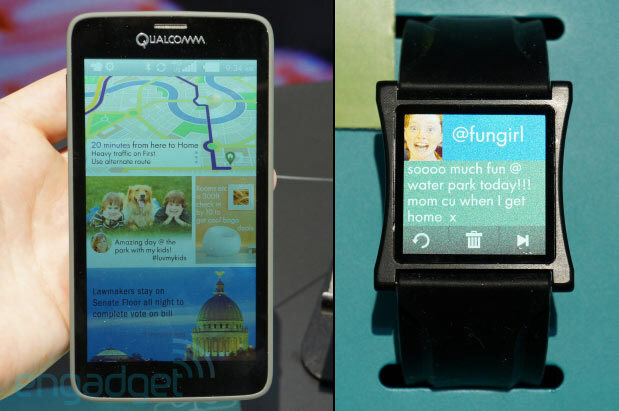 There have been rumors of Qualcomm's MEMS-based Mirasol display for years now. Once advertised as the "future" of e-reader displays, the company is now showcasing its proofs-of-concept. Engadget snagged a preview of both a 5.2-inch panel display with a 2,560 x 1,440 resolution and 577 ppi embedded into the chassis of a common smartphone body, as well as 1.5-inch panel on what looks like a smartwatch. A representative at SID Display Week, where the prototype was being shown, told the site that the displays were merely mock-ups, but that the screen will likely show up in other third-party devices. The Mirasol display is touted for its energy-efficiency. It offers a six-times-over power advantage compared to both LCD and OLED displays, which means it would be the kind of display that a smartphone would make great use of. It's made with a micro-electro-mechanical system (MEMS) based on Interferometric Modulation (IMOD) technology, which Qualcomm says "offer[s] users a convergent display experience with paper-like readability in almost any ambient condition, while consuming significantly less power than any other display available today."